I am using the Rotorsys program from IN3HER for antenna steering and tracking the moon. The system works fine with accurate tracking. I have been using it on 24 GHz to steer within 0.1 degrees. There are some problems with the DOS Rotorsys program I use, sometimes it is not calculating the correct moon and sun positions. It might be caused by an error in leap-year calculations but the error sometimes disappears. If I have the error I just set the date of the computer running Rotorsys one day in advance. I needed to do this the last few years but now in may 2010 it was not needed. I am not really sure what the problem is. I am still using the old DOS version running on an old 386SX computer. 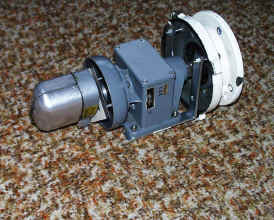 The azimuth and elevation position is determined with help off home made sensors using optical interrupters CNY37. I place two of these next to each other and connect them via an interface to the genius mouse. The mouse is used as interface between the computer and the antenna. 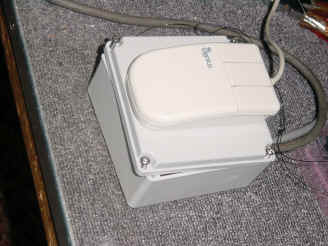 The optical interrupters from the mouse are disconnected and the antenna interface connects to the mouse original interrupter connections. 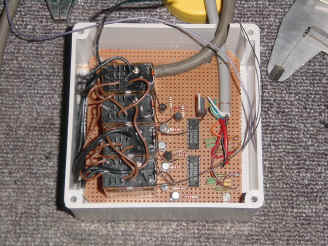 I will try to explain how I made my antenna control and reading. First I took my mouse and tried to get it work with the rotorsys program and see if the movement of the mouse changes the antenna reading. previous connection of the original mouse sensor. interrupted two times by a interrupter attached to the motor shaft. See the drawing of this (below). The sensor of the CNY37 is connected to the mouse via a transistor inverter. ones for azimuth and elevation. calculations with another computer running another program. Then I can see if rotorsys calculates right. The last few years I needed to set the day of the rotorsys computer 1 day in advance. So if the date is real 17 may I needed to set the computer of rotorsys to 18 may. I have been QRV last month and now it is not needed. I don't really understand the problem but sometimes its there and this is my way around it. When using rotorsys you can only switch off power supply after the dish is put in its parking position. I always bring it back to 220 degrees azimuth and 35 degrees elevation. That is my calibration fix. When I start-up I know the antenna is pointing at 220 and 35 degrees. These parameters can be set in the rotorsys.cfi file. Be sure that the antenna is not turning when the computer is off. Than I tell rotorsys that the system is calibrated (push the mouse buttons) and then I can start using the antenna. My readout is very good, I can readout within 0.1 degrees and the repeatability is also very good. The Rotorsys setup I use is with a dos computer so not running under windows. The Genius Mouse determines the direction of travel with help of two sensors and an interrupter which interrupts first one sensor and before it opens up again it interrupts the second sensor. In this way it can find the travel direction left or right. For elevation I am using a 36 inch sat TV actuator. I removed the original sensor (magnetic) because first of all its working unreliable and because I need to find the direction of travel and need two sensors to find this. The photo's give a clear view how I mounted the new sensors. The CNY37 is an optical sensor combined with an optical led. 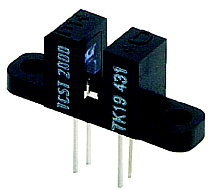 The led part is dc fed with 5 V dc and a resistor of 1 k ohm. The sensor part is connected to the interface above. The two cny37 sensors mounted next to each other on the motor for azimuth steering. 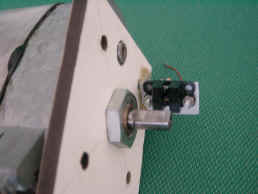 The shaft of this motor is attached to a small gearbox which is attached to the big gearbox I am using for my antenna. The sensors measure around 5100 pulses for the 360 degrees turning of the dish. The gearbox has almost no backlash and it turns within 0.1 degree. On the left the build interface between the CNY37 sensors and the Genius mouse. Also in this box the interface from the LPT computer port to the relais driving the az and el motor. I am using this interface to steer the motor drives left right for elevation and azimuth. I do not use the Az-Rotor fast and EL-Rotor fast relays so I did not connect these.